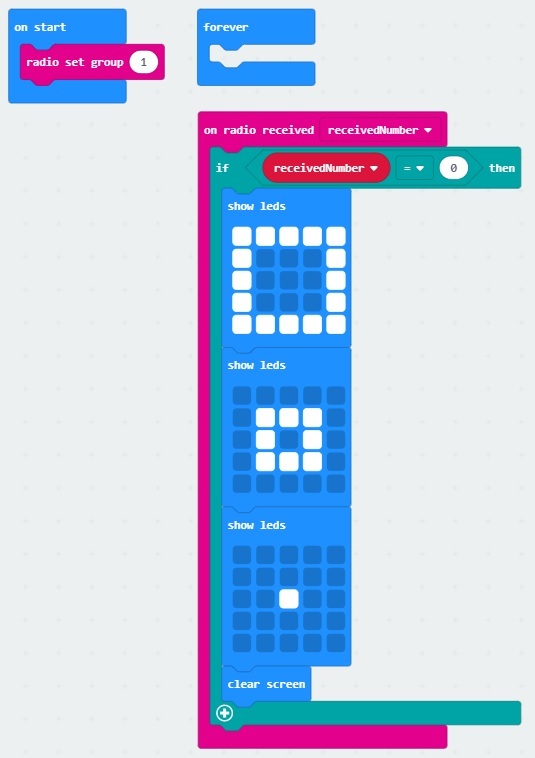 In this tutorial, we will utilize MakeCode&apos;s radio blocks to have one micro:bit transmit a signal to a receiving micro:bit on the same channel. Eventually, we will control a micro:bot wirelessly using parts from the micro:arcade kit! 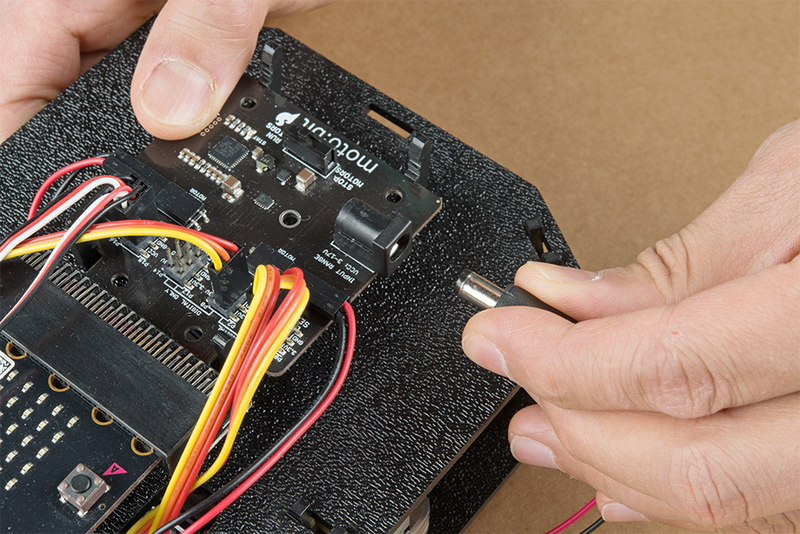 When the micro:bit is powered up, we'll want it set up the radio to a certain channel. In this case, we head to the Radio blocks, grab the radio set group &lowbar;&lowbar; block, and set it to 1. 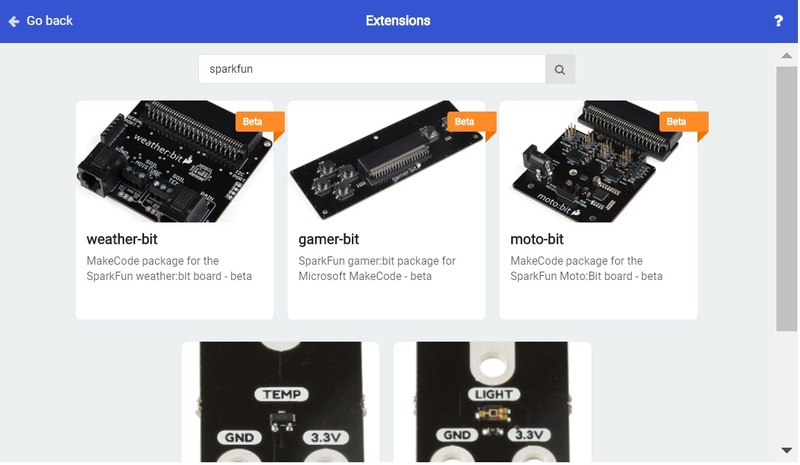 We will use the built-in button A on the micro:bit. From the Input blocks, we use the on button A pressed, Once the button is pressed, we will transmit a number 0 wirelessly. 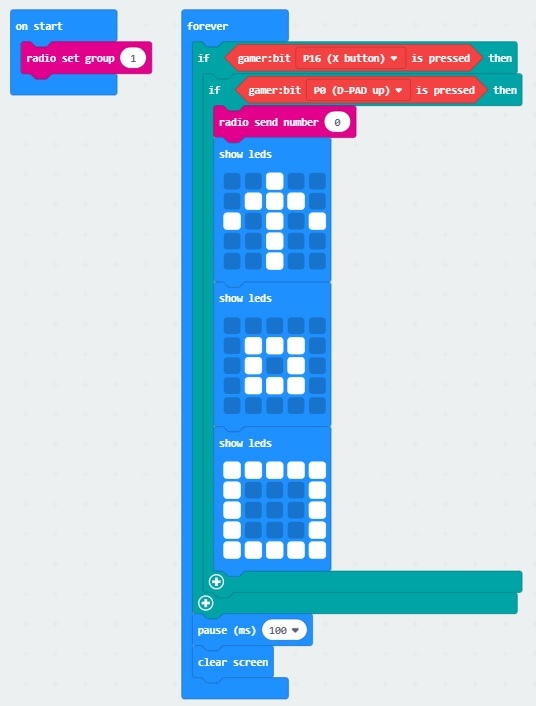 For feedback, we will use the Basic blocks to have the LEDs animate with a dot expanding out into a square to represent a signal being sent out. Once the animation is finished, we will clear the screen. Having a hard time seeing the code? Click the image for a closer look. When the second micro:bit is powered up, we'll want to set the radio to the same channel as the first micro:bit. In this case, it will be 1. Using the on radio received &lowbar;&lowbar;&lowbar;&lowbar;&lowbar;&lowbar;&lowbar;&lowbar;&lowbar;&lowbar; block, we will want to check to see what signal was received. In this case, we will want to check for a receivedNumber that is equal to 0 since a number was sent from the first micro:bit. Using the if statement from the Logic blocks, we will want to check if the variable holding the received number matches 0. 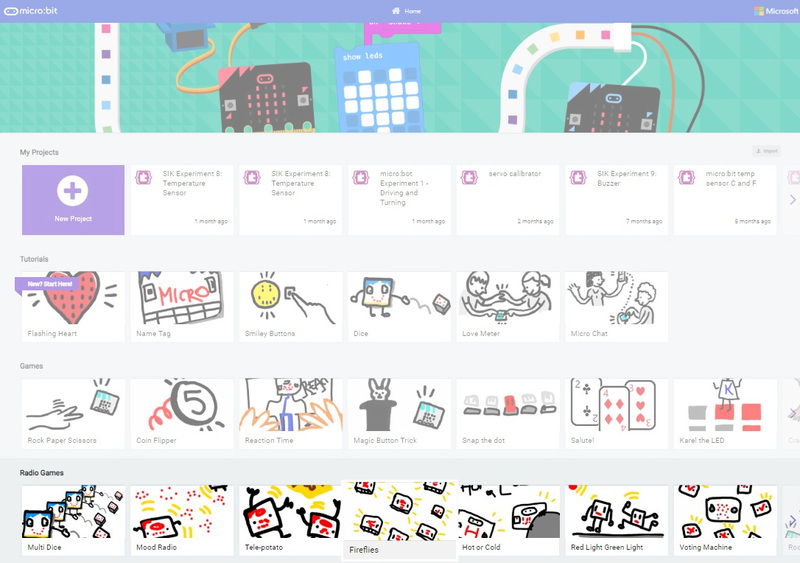 If it matches, we will want the micro:bit to do something. Visually, using LEDs would be the easiest so an animation of a square shrinking to a dot was chosen to represent the received signal. Once the animation is finished, we will want to clear the screen until we receive another signal. Remember our micro:bot? The micro:bot was running around loose by itself the last time we were working with the robot. Let&apos;s give it some commands so that it only moves when you want it to using the gamer:bit carrier board! 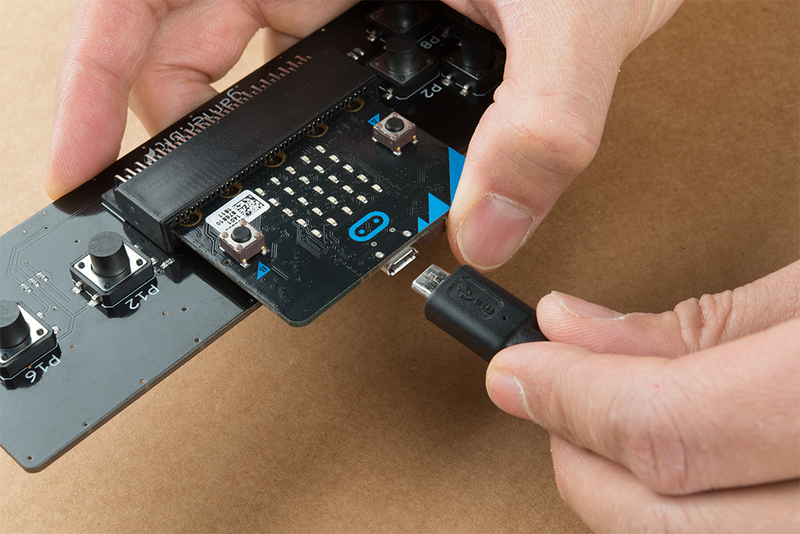 If you have not already, insert one micro:bit into the gamer:bit's carrier board. Make sure to insert the micro:bit with the LED array facing up (the same direction as all of the buttons) as explained in the micro:arcade kit experiment guide. We’re continuing on from experiment 3. Make sure to check out the guide before continuing on. 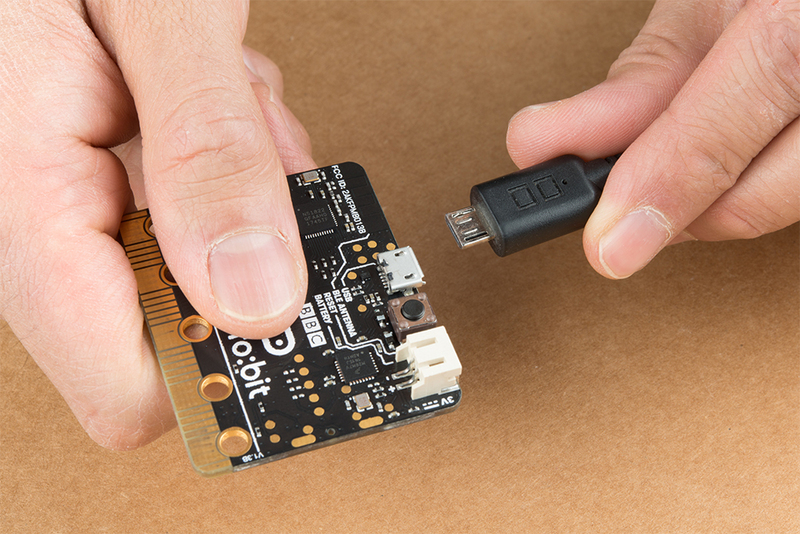 When the micro:bit is powered up, we&apos;ll want it set up the radio to a certain channel. In this case, we set the radio block to 1 just like experiment 1. Then we'll want to check if the P16 button is pressed on the gamer:bit, just like an accelerate button used in driving games. For simplicity, we will want the robot to move forward when pressing the up (P0) button on the direction pad. We will be using a nested if statement to check on the buttons defined in the gamer:bit extension. A nested if statement is one or more if statements "nested" inside of another if statement. If the parent if statement is true, then the code looks at each of the nested if statements and executes any that are true. If the parent if statement is false, then none of the nested statements will execute. By using the logic statement, we will be using the gamer:bit &lowbar;&lowbar;&lowbar;&lowbar; is pressed block. At this point, you should have your micro:bot kit assembled! We're continuing on from experiment 5. Make sure to check out the guide before continuing on. When the second micro:bit is powered up, we&apos;ll want to set the radio to the same channel as the first micro:bit; again to 1. As explained in the micro:bot experiment guide, we will want to set the left and right motors&apos; logic based on the way we connected the motors to the motor:bit. For consistency, we will make both true. Using the on radio received &lowbar;&lowbar;&lowbar;&lowbar;&lowbar;&lowbar;&lowbar;&lowbar;&lowbar;&lowbar; block from the moto:bit extension, we will want to check to see what command was received. In this case, it should be a 0 that was sent from the first micro:bit. If the command that was sent matches 0, we will want the moto:bit to drive forward at 100%. For feedback, we will have an arrow point up. After a short pause of about 50ms, we will want to clear the screen and turn the motors off before checking again. If the pause is too long, the micro:bot will continue to drive forward even after you remove your fingers from the gamer:bit&apos;s buttons. 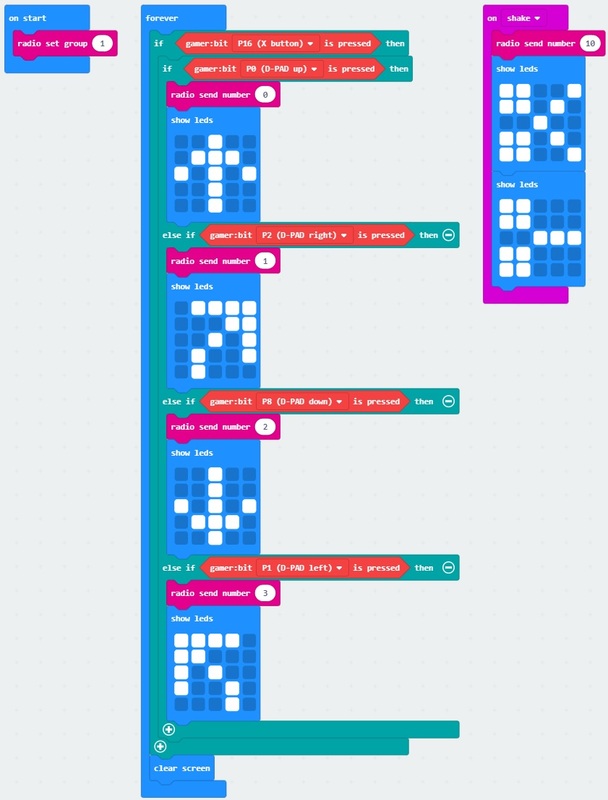 Now that both micro:bits are programmed, let&apos;s the test code out. Disconnect the USB cables from both micro:bits and power each with the respective battery packs. Using the same template for driving forward, we assign a unique number to the right (P2), down (P8), and left (P1) buttons on the direction pad. For simplicity, we will just want the robot to move forward when turning right or left. 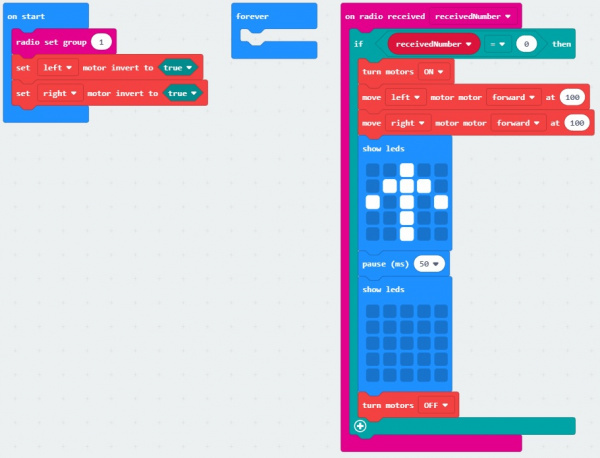 There is not as much animation with the LED array in this example since it can slow down your micro:bit. Using the Input&apos;s on shake block from the Input, a unique number is sent out to control the servos. Again, an arrow will display briefly for feedback in each case. We'll be using the same servo connection on the battle bot as explained in experiment 5. Make sure to check out the guide before continuing on. We set up the second micro:bit to use the same channel and motor logic as explained in experiment 2.2. Four more commands were added to the on radio received &lowbar;&lowbar;&lowbar;&lowbar;&lowbar;&lowbar;&lowbar;&lowbar;&lowbar;&lowbar; to turn right, reverse, turn left, and control the servo motors of our battle bot. When turning, the motor closest to the inside of the turn is set to a lower value. That way the robot will continue to drive forward but also move right or left. To reverse, both motors used the reverse option to drive backwards. Finally, if the robot receives a command indicating that there was a shake from the first micro:bit, the servos will move. If you look closely at the receivedNumber, each of the commands match the same number that was transmitted from the first micro:bit. Now that both micro:bits are programmed with more commands, let&apos;s test the code out. 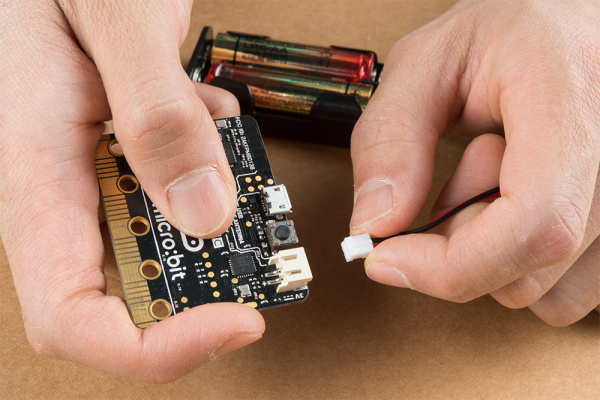 Disconnect the USB cable from both micro:bits and power each with the respective battery packs again. Pressing the gamer:bit&apos;s drive button (P16) and any of the buttons located in the direction pad (P0, P2, P8, P1) will cause the robot to move. Shaking the first micro:bit will make the servos on the micro:bot move. Try adjusting experiment 1&apos;s code to have the second micro:bit send a signal back to the first micro:bit. Ok, so experiment 3 did not have "all" the specified movements. We just gave some basic movements so that the micro:bot can move around the floor. Try adjusting the codes to turn when the micro:bot is moving backwards. Can you adjust the code so that the robot can rotate without driving forward or back? Or maybe program the robot to dance when a certain button(s) are pressed. Try flipping the control of the buttons and sensors. Instead of using the buttons to control the robot&apos;s motion, try using the accelerometer or magnetometer. Can you control the motor intensity based on the sensor reading? Then, to control the battle bot&apos;s servos, try using the buttons. Make sure your motors are hooked up correctly in the motor ports and your motor power switch is set to "RUN Motors", the battery pack is plugged in, and you have fresh batteries. There are two options if you notice the micro:bot moving in the wrong direction. As explained above, you can flip the wiring of your motors or use the set &lowbar;&lowbar;&lowbar;&lowbar; motor invert to &lowbar;&lowbar;&lowbar;&lowbar; block in your on start block to change what is forward vs. reverse. Servo Doesn't Move at All! Now that you've successfully got your micro:bits communicating, it's time to incorporate it into your own project! Need some inspiration? Check out our other robots found in our robotics section. Assembly Guide for the RedBot Kit. This tutorial includes extra parts to follow to go along with the RedBot Inventor's Kit tutorial. Looking for more wireless fun? Check out the following using wireless applications. 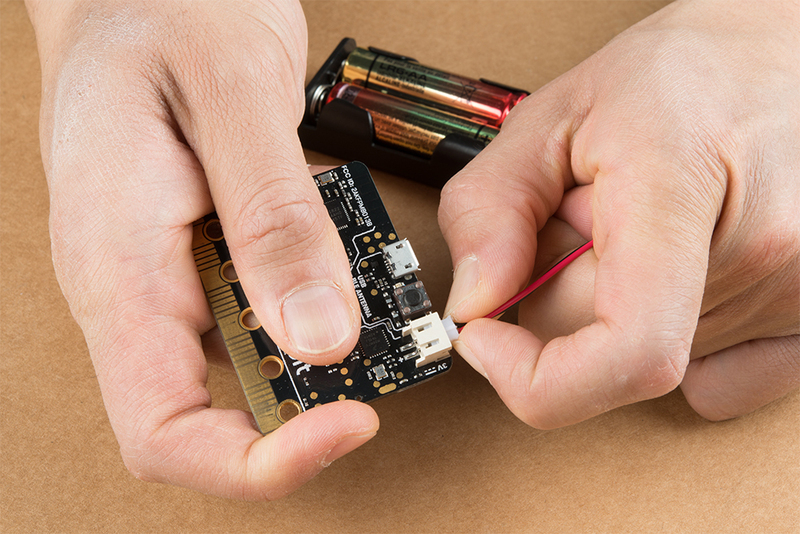 SparkFun has two boards using the BC127; here's what you need to know to use them. A quick tear down of the popular fitness tracking device, the Misfit Shine. The HX1 is a low-power amateur radio transmitter that can be used to send data to the Automatic Packet Reporting System (APRS) network. Or try checking out these cool robots from AVC.